With warmer weather finally arriving, many people are spending more time outdoors. Whether you are walking, running, biking, or just enjoying the outdoors, sidewalks provide a safe place to travel on foot. As a pedestrian, it is important to use designated sidewalks at all times near or around roadways and highways to minimize the risk of a traffic related accident. But who is responsible for maintaining sidewalks? Under West Virginia law, sidewalk maintenance is generally the responsibility of the property owner, or in some cases, the lessee or occupier of the premises. While we often think of slip and falls happening during cold, icy weather, preventable accidents can also happen during warm weather. Runners, joggers, and bikers are susceptible to falls when sidewalks are left in disrepair. 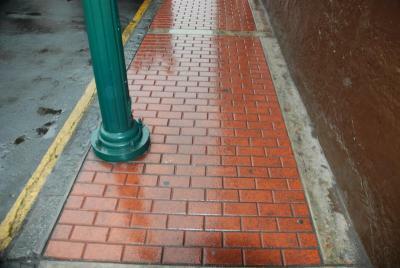 Cracks, dips, bulges, loose pavers or even missing concrete in the sidewalk create tripping hazards. Tree roots and water flow are often the cause of uneven sidewalks and should be corrected immediately by the owner. Additionally, outdoor spills can also cause slippery situations. If oil or similar substances are spilled on sidewalks or parking lot areas, owners are responsible for cleaning up the hazard. It is also important that patrons report such conditions to property owners to ensure the condition is addressed. As a business owner or homeowner, keeping public sidewalks safe and well maintained must be a priority, especially as the weather improves and more people engage in outdoor activities. A preventable slip and fall can result from one of these unsafe conditions, causing serious personal injuries such as sprains, strains, and broken bones that lead to medical expenses, lost wages, and pain and suffering. If you’ve been hurt in a slip and fall injury, contact Tammy Bowles Raines for a free consultation.